In a small bowl, mix mango, sugar, lime zest and juice. Mix well and let sit for 10 minutes. 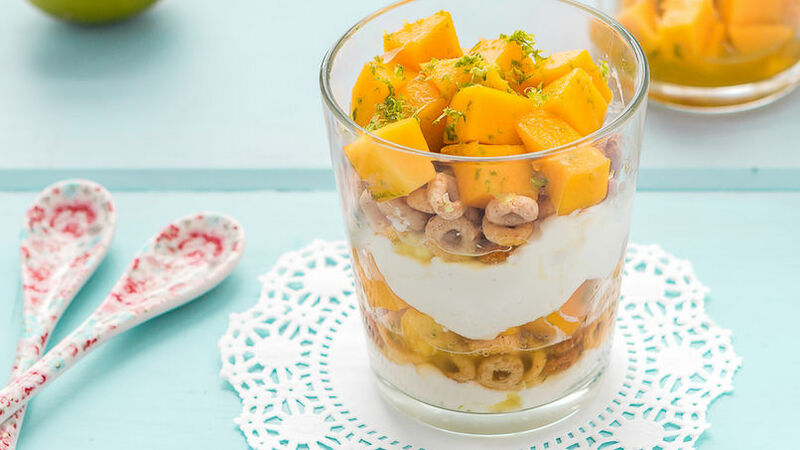 Add a layer of ricotta cheese to the bottom of a glass, a layer of Cheerios™ and a layer of the mango mixture. Repeat the process and finish with a layer of mango. Repeat in another glass. Add a little sugar to the ricotta cheese to make it sweeter. A few weeks back, I ordered a ricotta parfait at a restaurant. The truth is that when I ordered it, I assumed it was made with yogurt, so I was quite surprised when tasted the Ricotta. It was a good surprise, by the way! Parfaits are perfect for a Sunday brunch or as a healthy snack. They are truly delicious!